The proposals developed by the Park represent an interesting opportunity to discover different aspects of a protected area in a mountainous environment of international relevance and at a short distance from the capital cities of Piedmont and Aosta Valley. 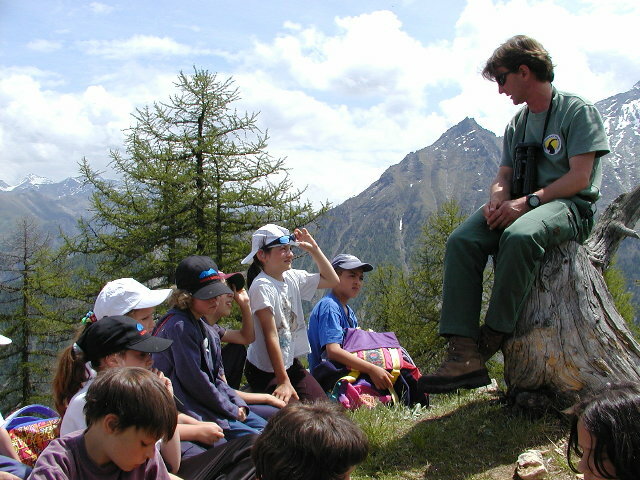 Thanks to its old establishment, the Gran Paradiso National Park boasts extensive knowledge of its natural ecosystem of the territory's history, representing an ideal outdoor educational workshop. The spectrum of proposals ranges from more naturalistic themes to anthropological and historical ones, and they are all marked by stimulating the development of a critical sense in understanding the relationship with the environment and in awareness of responsible behaviour regarding precious environmental heritage. The activities are carried out by educators, park interpreters, nature guides, park rangers trained in environmental education, and experts working for several years in the area. They are structured with actions in the classroom (for schools), excursions in the territory and practical activities in the countryside and in the various park structures (Environmental Education Centres, Visitor centres, laboratories ...). It also possible to construct ad hoc projects with teachers, to meet the specific needs of the class, while enhancing the experience and suggestions of the teachers. The environmental education program includes both activities aimed at schools of all levels and grades, andproposals aimed at other interested users (groups, families, individuals). Within the initiatives, environmentally friendly sports activities conducted by qualified personnel may also be incorporated, in order to foster an environmentally friendly approach. Given the mountainous structure of the park territory, participation in educational activities is even possible for children with mild impairments, with the support of a teacher/guide, and for persons with mental disorders, accompanied by the support teacher. Visitor centre and Homo et ibex museum, at Ceresole Reale (TO), with an exhibition devoted to the relationship between man and the ibex throughout history and in art up to the present day, and a conference room. Visitor centres in Cogne, Rhêmes Notre Dame and Valsavarenche, included in the Aosta Valley regional system for environmental education (Infea Network), are respectively home to permanent exhibitions devoted to the relationship between man and environment, the return of the bearded vulture to the Park, and the predators in the protected area. The old school of Maison: hosted in the Roc valley, the old elementary school, recovered and refurbished by the Park, that with its original desks, blackboard, small chair and the teacher's apartment, tells us how the children and their families' life could be, they lived in that seven wonderful hamlets the whole year until the 1950s. For schools: if you're a teacher and aim at knowing the Gran Paradiso didactic offer divided into school level, go to the webpage dedicated. For everyone: If you want to discover all the visiting and staying opportunity divided into areas of interest, a webpage dedicated will be published soon. For more informations please contact the Park tourist secretary: no. 011-8606233, monday to friday 9/12 or e-mail: info@pngp.it. scarica la tesina "L'animazione naturalistica come metodo educativo"